"I am the stuff of your nightmares...You have been writing my name on the walls of your fear your entire life. "When seven-year-old Jamie falls down a very long hill, he finds himself trapped in a world of strange creatures, harsh landscapes, and near-perpetual darkness. Lost and confused, Jamie is desperate to get home. The nightmares, fears, and all manner of what-ifs that inhabit this shadow world are unfamiliar to him?all except one: the Lairdbalor, Jamie's personal nightmare, once relegated to his dreams. In this fantastical land, however, the Lairdbalor and all the fears and nightmares of children are very real.But Jamie's nightmare is different. It is the sum total of the anger and anxiety that imprisoned him in his former life, and it threatens to consume and rule the nightmare realm, a place where time passes differently. With each slumber, Jamie finds himself inexorably changed. 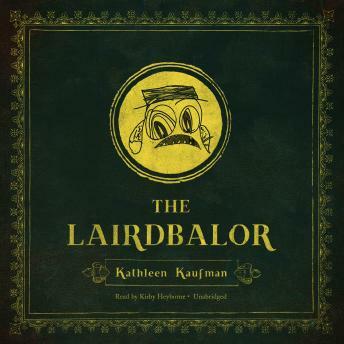 The farther he travels through this terrifying world, the better he understands the one he left behind.Crossing genres of folklore, horror, fantasy, and magical realism, The Lairdbalor is a story for anyone who lives with anxiety and fear and has ever wondered, "what if?" It is the story of a child not meant for children and a darkly imaginative meditation on life, death, fear, and the nature of reality.